Outloud Audio is an award winning audio post-production studio with celebrity friendly facilities in Los Angeles and New York City. 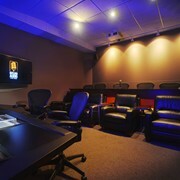 We focus on dialog for animation, ADR, Looping, Loop Group and offer connections via ISDN, Source Connect, and phone patch. We have 5 beautiful studios in Burbank including a full loop group stage, large dialog recording rooms with stadium seating, and high end vocal tracking rooms for songs for television and film. Ample parking, signature cappuccino's and the highest quality audio deliverables. We also have two beautiful stages in New York City. Photos of two of our stages and their control rooms.